The findings are generally in line with the ways the two candidates have debated in the past. McCain is a bit more emotional, impulsive, and personal than Obama. On the other hand, Obama is more abstract and cognitively complex. Joe Biden is notorious for embarrassing interview blunders. He can be a little too uncensored and tends to go off-message when he’s not reading from a script. Our analysis shows, however, that Biden’s speech writers might want to take a few cues from his interview persona. In interviews the Democratic vice presidential candidate is more human and less severe than he is in speeches. When talking as himself, Biden talks like a normal person, using pronouns and verbs at rates that closely match the speaking styles of the average people we’ve recorded over the years. Consequently, in interviews Biden is more approachable, more socially connected, and also more cautious and insightful – in other words, he sounds like a human leader rather than a stuffed suit. The good news about Biden’s interview language is, unfortunately, bad news for his speeches. In speeches Biden comes across as stern and slightly awkward. Whether a candidate appears warm and human or cold and preprogrammed could decide the election. It has in the past. I mean, I hear this talk about, you know, is she going to pick up Hillary voters? Well, I–so far I haven’t heard one single policy position, one single position that she has in common with Hillary. I mean, I think it’s–well, I don’t–look, that’s for voters to decide. … And as I look down the road, that’s how I’ve always debated whoever I’ve debated, including the really tough women I work with, smart women, in the Senate. So I, I, I really don’t view this any differently. I may be surprised here down the road. But, but, you know, I’m just looking forward to debating her. I mean, why–look, she had a great speech. But what was–her silence on the issues was deafening. Here Biden is using “look,” “see,” and “hear” in ways that would be common in a normal conversation. He also talks about deafening silence and looking down the road, using sensory metaphors so that his points sink in immediately and make a more visceral impact. Using sensory words figuratively and literally reminds us that Biden is a person – a seeing, hearing person – rather than a disembodied head floating above a lectern. God and emotion: praying for the troops, but without the melodrama. Biden’s interview language is also more natural in that he talks less about God and death less and uses fewer emotional words than in speeches. In the last several years Republican politicians have made a point of talking about “godless liberals” to motivate fundamentalist Christian voters. Consequently, Democrats have had to talk about God a lot just in order to convince voters that they aren’t in fact heralds of the Beast. The fact that Biden talks about religion a lot more in scripted speeches than in off-script interviews may be caused by this trend. His notoriously uncensored interview language is probably closer to his normal way of speaking. Importantly, in interviews Biden talks about religion almost exactly as much as an average person in conversation: rarely (.3% for Biden, .2% for average people). Religion is private and, in face-to-face talks, Biden usually keeps it that way. In speeches, Biden used 3.5% negative emotion words, compared with 2.5%, the average for people in conversations. Speeches are meant to be stirring, and it makes sense that speeches given by candidates who oppose the current administration would contain more negative emotions than would be normal in any other setting. So while it’s not necessarily a bad thing that Biden uses more negative emotions in speeches, it is a good sign for the Democratic party he’s less melodramatic and more easygoing in conversation with interviewers. Comfortable, emotionally controlled interviewees make better diplomats than hot-headed gunslingers. Pronouns, verb tense, and cognitive complexity: “I know,” “because I think.” You can also see in the examples above that he’s using less “we,” and more “I” and third person singular (she, he). He still uses “I” at a pretty low rate in interviews, on average — 4.8% in his most recent interview, with Brokaw, and 2.8% on average over the last three years. But Biden is no Woody Allen – his “I” use is certainly not off the charts. While high “I” – above about 8% — is correlated with neuroticism and maladaptively high self-focus, Biden’s “I” use in the Brokaw interview and on average is significantly less than most people. Low “I” use in conversation usually signifies that the speaker is of higher status. Rather than talking about himself, he is thinking about others, what they should do, how their actions will affect the US, etc. His relatively low “I” use here probably reflects the fact that he is, as a vice presidential nominee with a long, venerable resume, objectively a high status politician. Also, when Biden uses “I” it’s very rarely in self-critical or self-obsessive ways. In interviews Joe Biden says “I think,” “I know”, and “I mean” frequently. In fact, in speeches and interviews, Biden uses tentative (probably, depends) and insight words (think, know) as well as prepositions (about, within) and conjunctions (but, or) more often in interviews than in speeches. All of these word categories signify greater cognitive complexity. Tentative words particularly are signs of carefulness and restraint – good qualities for a wartime leader to have. His higher use of “she/he” (1.6% vs .7% in speeches) and “you” (1.6% vs .5%) also shows that he is somewhat socially oriented, and that he is thinking and talking about others almost as much as he is about himself. Again, his “she/he” use is still only about average – he pays attention to the people around him, but he’s not a gossip. Verbs, past and present. Biden uses present tense and past tense more in interviews than in speeches, although he still uses both tenses less than we normally see in average conversations. His speech writers—and the Republican nominees’ writers, by the way—seem to be trying to spread their message of hope and progress by talking about the future more often than is normal, and the past abnormally infrequently. Usually people use past tense about four times as often as present tense (4% vs. 1%); in Biden’s speeches, he references the future about as often as the past (1.6% past vs. 1.4% future). Talking more about the future and less about the past in speeches may backfire, making Democrats seem more like starry-eyed future gazers rather than battle-ready realists. In the last few months and during the elections of 2000 and 2004, analysts on both sides of the political divide complained that Democrats failed to seize a multitude of opportunities to capitalize on Republicans’ vulnerabilities – including blatant hypocrisy (male anti-gay rights activists seducing young men online) and campaign misconduct (calling voters at inopportune times with obnoxious messages supposedly from Democratic candidates). The sub-normal levels of past tense verbs in both Biden’s and Obama’s speeches indicate that the party so far appears to be set on the same naïve path. When Biden is uncensored, on the other hand, he basically gets it right. His increased use of verbs — particularly his much more normal use of past and future tense verbs — makes Biden seem more like a man of action and an everyman in interviews than in speeches. Summary. To sum up, in interviews Biden comes across as a high status, cognitively complex, but eminently approachable everyman. In terms of pronouns, Biden’s language is high status (lower than average “I”) but personable (higher “I” and lower “we” than in speeches, higher “she/he” and “you” use). He also seems to be an insightful, careful leader, as you can see by his increased use of insight words and other measures of cognitive complexity. Biden also has a tendency to pay much more attention to the present and past in interviews than in speeches. In this respect his language is much closer to a normal person in conversation than most future-gazing politicians. He is also much more natural when talking about religion and emotions in interviews compared with speeches. In speeches he uses far more negative emotion words and religious words than the average person, while in interviews his language in these categories is indistinguishable from the common man he wants to represent. The ways people use pronouns tells us how they are viewing themselves and their social worlds. 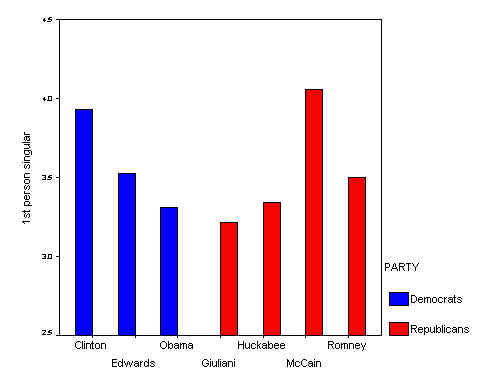 The analysis of five Republican and Democratic debates (June 2007, November 2007, December 2007, and two January 2008) were analyzed by each major candidate’s use of pronouns. Not surprisingly, each candidate reveals a different side to the audience. In previous elections, Bush used “I” words at much higher rates than either Gore or Kerry; Bill Clinton used them more than Bush 41 or Dole. Check out the graph. Check out the second graph. You see that Obama, McCain, and Romney are the highest along these dimensions. The I versus We ratio. One more way to look at I and we is to compute a ratio where I-use is divided by the sum of I plus We. Based on previous elections, the higher the ratio (that is, the relatively more use of I), the more likely the person was to get elected. Overall, Clinton and Edwards are the highest by far with Obama the lowest. 1st person pronoun conclusions. Don’t bet the farm just yet but the pronoun count strongly favors Hillary Clinton. Someone should have a little chat with Obama about his vague overuse of “we”. Who is the “we” he keeps referring to? Is he using this as code for “you”?